Does this mean that some “Joe or Jane” public can file a complaint if they think schools should be teaching that the Earth is flat and not an oblate spheroid? Many of the affidavits filed in support of the bill complained about evolution and climate change being taught. One even complained that they have seen global warming being taught as a reality. Hellooooo000, it is a reality. Numerous credible sources show that our climate system is warming, and even many conservatives are now acknowledging the threat. Sea level doesn’t care about “red” and “blue,” it just rises. This week one of the climate doubter’s signature arguments was dealt a blow. A new study by some of the pioneering satellite climate scientists found that their measurements of warming had been underestimated. 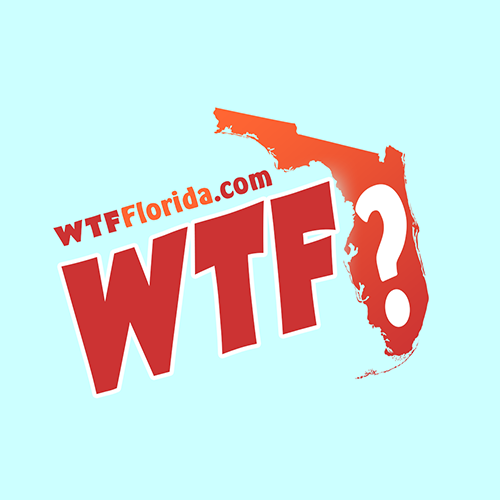 What struck me about the Florida law is that there are two sad ironies with this so-called “Anti-Science” Law. Human activity is contributing to climate change. Its effects, expected to only worsen over time, are happening right now in South Florida. Hiding from that reality will not change it. And if the near-universal conclusions of climate scientists aren’t enough for him (referring to President Trump’s exit from the Paris climate agreement) perhaps he should consult with the property appraisers or insurance companies in South Florida who are already factoring sea level rise into their home value assessments…..Ask any of my constituents about an experience they’ve recently had with flooding, and you’ll likely get a lengthy story. Listen to enough stories about South Florida’s ever-increasing king tides, and you’ll hear about fish swimming in the streets. Florida has been a leader in science. The other irony comes from reflecting on some of the greatest science and technology achievements in history. NASA is a national treasure, and I was privileged to work at NASA’s Goddard Space Flight Center for twelve years as a scientist working on Earth science related missions. As I left NASA to join the faculty at the University of Georgia, people were stunned that I was leaving NASA. It is that awesome. One of the interesting things as I reflect on from my NASA days is that people would always ask me if I worked at Kennedy Space Center. My answer was always no. NASA has several different space centers around the United States, and they all have different specialities. As I reflect on this new Florida law, it is almost a slap in the face to a state that so many associate with scientific greatness and the space program. It is also now hosts several private enterprises like Space X, which are pushing the boundaries of science and technology. These companies will need a scientifically literate workforce not students spewing fringe theories. This Florida law sends a dangerous message about sound science and would make me nervous if I was a parent sending a child into this type of situation. Such a law opens up so many “cans of worms” that another commentary could be written on that topic. We are currently in a time period where opinions and beliefs mean more than facts. If you stand on the top of your roof, do no get too close to the edge because there is still gravity whether you believe so or not. As I write this, CBS News is reporting that the current White House Office of Science and Technology Policy (OSTP) is unstaffed and there is currently no person appointed as White House Science Advisor. There is still no NASA Administrator appointed either. We have officials at the Department of Energy that dispute published science that people from both sides of the aisle acknowledge. We have an EPA Administrator calling for silly “red and blue” team climate reviews when science journals, conferences, the National Academies, and others already provide sound mechanisms for independent review. 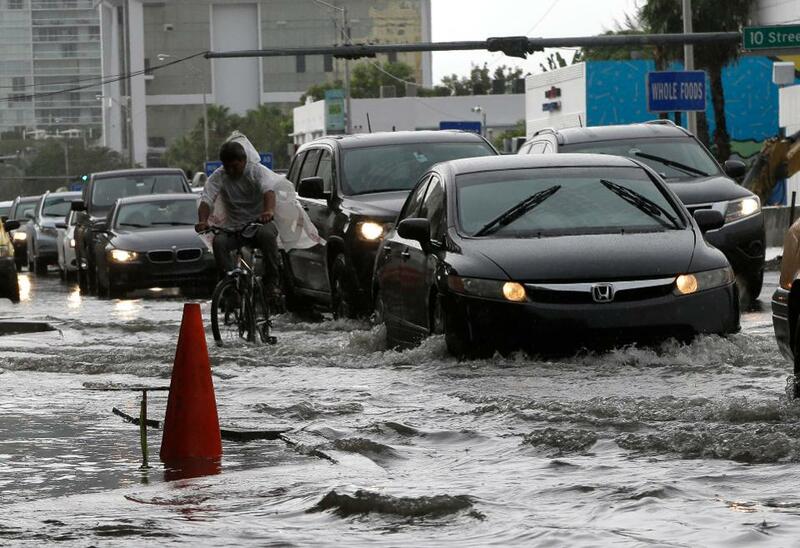 And perhaps the ultimate irony as someone suggested in a tweet, it adds more layers of process and government intervention…..
A cyclist and vehicles negotiate heavily flooded streets as rain falls, Tuesday, Sept. 23, 2014, in Miami Beach, Fla.